I love the feeling of anticipation that accompanies the end of summer. For me, this time of year represents transition, looking forward to cooler and crisper weather, a fresh start, and new beginnings. My sons go back to school, get new clothes, school supplies, haircuts and sneakers, and there are a few wardrobe updates for me too. Searching the Internet for new fashion items is always fun for me, and I like to do some serious research before making any hasty purchases. I’ve been spotting some really amazing clothes, accessories and footwear, and I’d love to share my discoveries with you. My first fashion find is “way cool” jewelry from a company called Daphne Rose. The founder of Daphne Rose is the cousin of Yonni Wattenmaker of The Trendy Vegan, where I recently learned about this impressive accessory line. 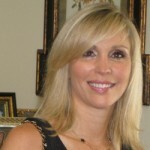 Daphne Rose’s collection is all beaded, metal, string or crystals…no leather. It’s cool, reasonably priced and vegan! Check out Daphne Rose’s Love, Love, Love Bracelet, Faceted Stone Cocktail Ring, Glass Stretch Buddha Bracelets, and Bubble & Glitz Statement Necklace. *Note: The dress in the photo below by Aidan Mattox was originally posted as having a Faux Leather Bodice, but Aidan Mattox contacted me and told me that Bloomingdale’s website incorrectly labelled it. The leather is real, and Bloomingdale’s has since changed its website. It is not vegan! Checked out your blog post and realized that the dress you selected to feature is actually real leather. Bloomingdales had the dress mislabeled and have been notified by our sales team. We are so sorry about any confusion. However I have attached several dresses as alternatives as they do use faux leather. Thanks! Free People has been doing an amazing job with their line of vegan leather jackets, clothes, handbags and shoes. 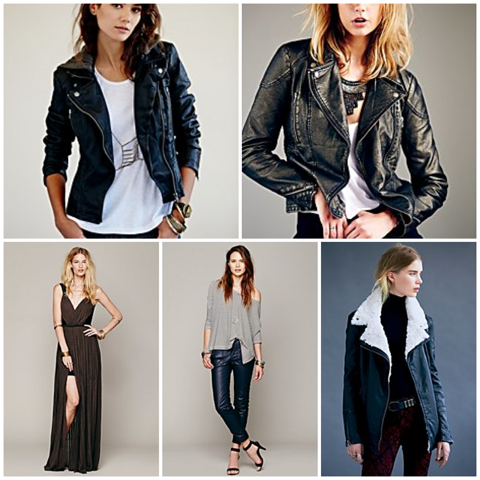 The following items are my favorite picks for the Fall 2013 which you can find on Free People’s website: Vegan Leather Hooded Motorcycle Jacket ($168.00), Vegan Leather Metallics Jacket ($168.00), Streets of NYC Maxi ($168.00), Rocker Vegan Leather Skinny Pants ($128.00) and Vegan Shearling Motorcycle Jacket ($268.00). Nobody does vegan style better than Stella McCartney who, in my opinion, is the “Queen of Vegan Couture Fashion.” Although these Fall accessories are quite pricey, I was taken with the gorgeous gold chains on the handbags and the classic elegance of the stunning ankle boots. 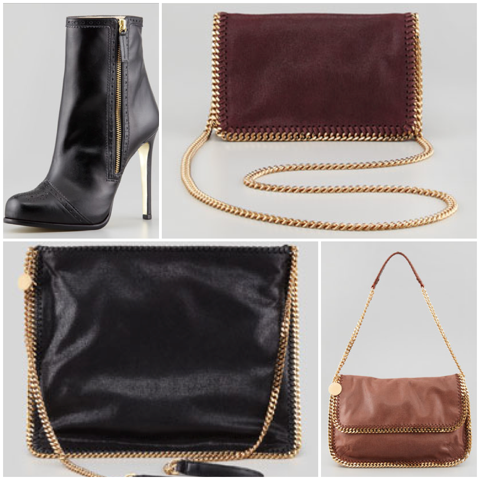 You can find my favorite Stella Picks for the Fall 2013 on her website or online at Neiman Marcus: Faux-Leather Wing-Tip Ankle Boot ($695.00), Falabella Small Chain Crossbody Bag in Plum ($1075.00), Falabella Medium Crossbody Bag in Black ($1230.00), and Falabella Flap Messenger Bag in Maple ($1495.00). 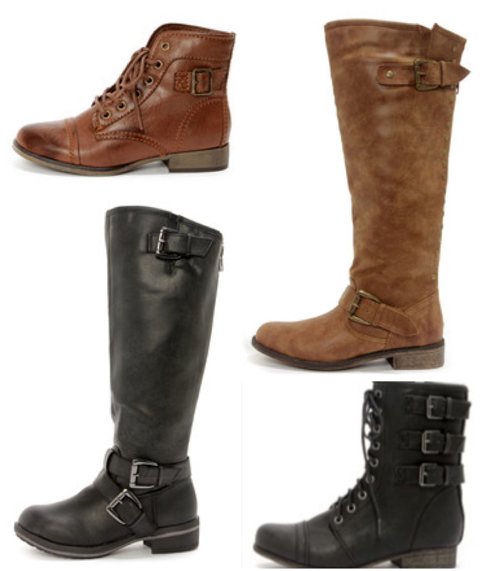 On a more affordable note, I really like some of the Madden Girl footwear for the Fall which can be found on the Madden website: Madden Girl Army Lace-Up Ankle Boots ($59.00), Madden Girl Cactus Cognac Studded Knee-High Riding Boots ($79.00), Madden Girl Legacie Black Belted Knee-High Motorcycle Boots ($79.00), and Madden Girl Ginghamm Black Buckled & Lace-Up Combat Boots ($69.00). 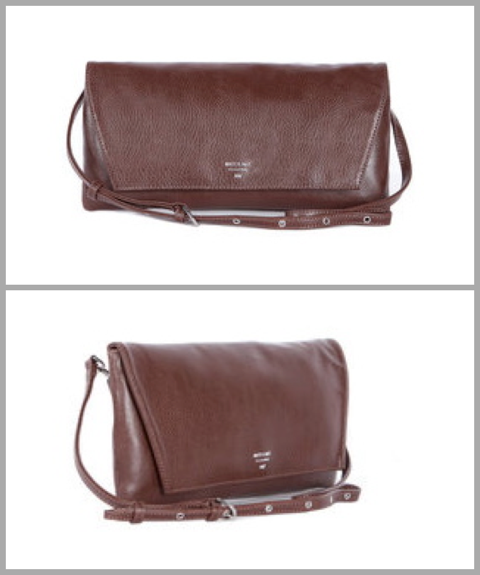 My final Fall fashion pick is Matt & Nat’s Mile-End Shoulder Bag in the color Cognac. This beautiful bag has a detachable strap and can also be worn as an oversized clutch. It can be purchased for $100.00 on Matt & Nat’s website. 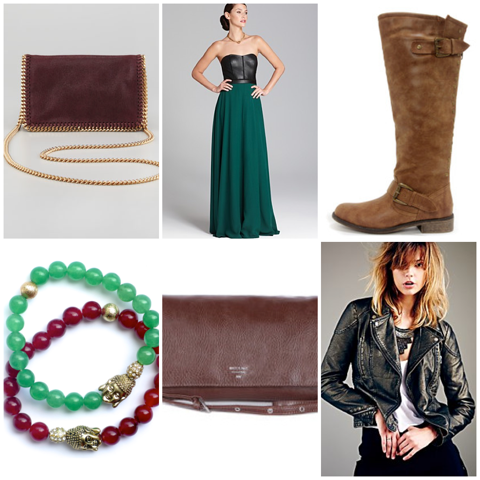 There you have it…VAP’s Fall Fashion Picks for 2013. Since it’s still only August, I’m sure that I’ll be coming across many other new great fashion treasures. When I do, I promise to keep you posted and let you know about them. Click here to read Ethical Clothing For Men: Levi’s Faux Leather Trucker Hoodie, Alternative Apparel and More! The jewelry is gorgeous and the pleather is really happening! !